Nigerian Pepper Soup: be it Goat Meat Pepper Soup, Catfish Pepper Soup, Chicken Pepper Soup, is one of the most asked for Nigerian Restaurant Specials. 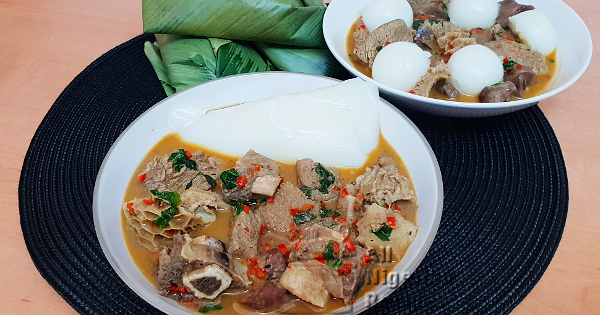 When you combine any pepper soup dish with White Agidi/Eko, that’s food haven! You’ve not tried this combo? You don’t know what you are missing. Ehu (calabash nutmeg) is the only pepper soup spice you need for the classic taste of Nigerian Pepper Soup. All those pepper soup mixes will ruin the taste for you. Note that this is NOT ordinary nutmeg used in cooking Nigerian Moi Moi. For the classic taste of Nigerian Pepper Soup, use scent leaves. Scent leaves are not common outside Nigeria hence lots of people are tempted to use mint leaves. Please do NOT use mint leaves for Nigerian pepper soup because it is not a great alternative to scent leaves. Mint leaves will ruin the pepper soup for anyone who knows what Nigerian pepper soup tastes like. Feel free to add other parts of beef you like such as liver. The sweet pepper is just to add colour to the pepper soup, it is not spicy at all. Clean and cut the parts of beef into single bite pieces. If using ribs, the butchers should be able to cut it into pieces for you. Peel and grind the ehu with a spice grinder. Chop the habanero and sweet peppers. Cut the onions into big chunks. You don’t want pieces of onions in your Nigerian Pepper Soup. Start cooking the toughest parts of meats first, in the above case they are the ribs and the cow tripe. Add those two into the pot, add thyme, ground ehu and seasoning cubes. Steam without adding water while stirring at the same time till everything is well heated up and the ribs are pale. Add the chunks of onion, pour water to cover the meats, cover and start cooking. Keep an eye on it and always top up the water when necessary. After 40 minutes, remove the chunks of onion, add the heart and the kidney, top up the water if necessary then cover and continue cooking. After another 15 minutes, all the meats should be well done without being too soft. Add the chopped peppers and the scent leaves. Add salt if necessary. Cover and cook for at most one minute and it is ready! Serve piping hot on its own with a chilled drink or with White Agidi/Eko or Boiled White Rice.